Blink’s early career as a tour promoter and photographer set him up as a respected figure within the local indie scene, but he was unwilling to cruise on this success. Instead he applied his DIY approach to touring to the international circuit, taking Disasteradio and Over the Atlantic on extensive world tours. Meanwhile his A Low Hum festival continued to grow and he eventually tried his hand at both running a venue and writing his own books. His one-man crusade to change the local music scene had only just begun. Two months after the second Camp A Low Hum, Blink helped arrange an overseas tour by Over the Atlantic (to promote their 2008 album Dimensions). The group, led by Nik Brinkman (formerly of Ejector), had signed to Carpark Records in the USA, which also released solo work by the band’s producer, Bevan Smith. The band had already undertaken a 20-date tour of the USA in 2006, supporting Beach House. The budget for the tour was miniscule and mostly taken up with paying for airfares, so he also arranged for them to crash out at the houses of people who attended their shows. This seat-of-your-pants approach was mostly successful, but it did often leave them having to sleep in the car or camp out where they could (the worst case, being a rainy, cold night in Scotland, which led to water leaking heavily into their tents). The Over The Atlantic tour went from April to September and when Blink returned he went straight back into gear organising Camp A Low Hum. 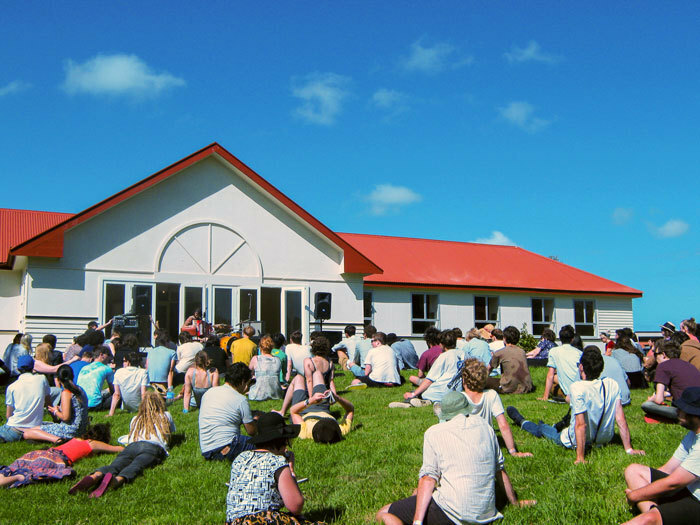 The 2009 Camp was held 6-8 February at Camp Wainui in Homedale, an old Boys Brigade campground that was surrounded by thick forests of native bush. 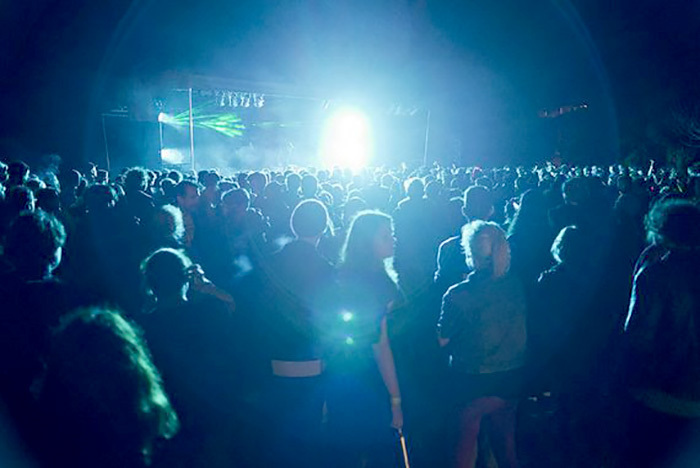 It was another suburb of Wainuiomata, where he’d had trouble with noise complaints in 2007, but this time he took more care to bring the local community on board and made it clear that any annoyance caused by the arrival of over 800 festival goers would be far outweighed by the boost to the local economy from their spending in nearby shops. One of the unexpected highlights of 2009 was undoubtedly the performance by the Finn Family band, with Neil, Liam, and Elroy punching through a run of greatest hits. In previous years, Blink had relied on a few of his favourite acts to bolster the line-up, but from this point forward he focused on trying to get acts that hadn’t played before and raising the profile of new acts. 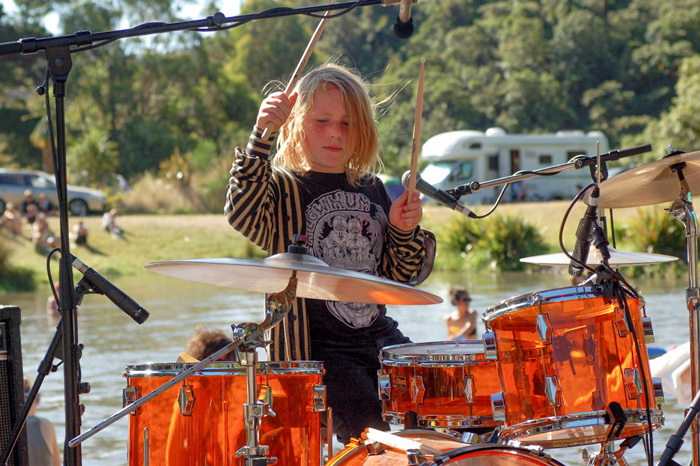 However, one of the unexpected highlights of 2009 was undoubtedly the performance by the Finn Family band, with Neil Finn and his sons Liam and Elroy punching through a run of greatest hits from Split Enz to Crowded House to Liam’s own tracks. Despite the vicissitudes of the event, it ended up being the best year financially. Blink lost money the first year he ran the event and only managed to break even the following year, but now he had enough to pay off loans from his parents and girlfriend. What’s more, for the past few years he managed to support himself from his involvement in music and no longer had to rely on his photographic work. It was still a stressful way to live and, at least initially, Blink felt it would be easier to walk away from his role as festival organiser for good. 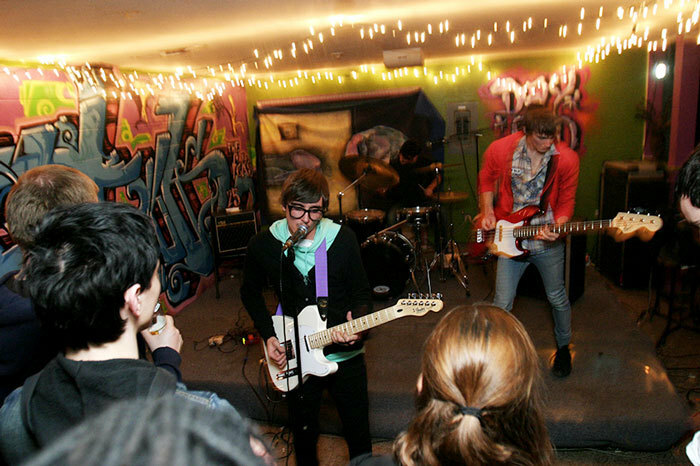 Blink’s most immediate concern was another world tour that he was arranging, this time for synth-pop act Disasteradio (Luke Rowell). The pair’s friendship went back to 2003, when Blink was impressed by his set at Thistle Hall (in Wellington). Blink once again took the DIY approach by emailing countless venues to piece together a run of paying gigs. Gaps in the schedule were then filled with whatever shows could be found – whether it was playing just for accommodation in a convenient town or playing challenging events like doing a frat party in Illinois or performing at a drop-in centre in Chicago. Blink’s role was much easier on this occasion, since he didn’t have to sort out backline for each show, though by the end of the tour, they’d driven 30,000 km and survived from April toSeptember on five euros a day. Following this tour, he wrote an international version of his Local Knowledge book and released it in draft form, so he could share what he learnt from touring two bands overseas. 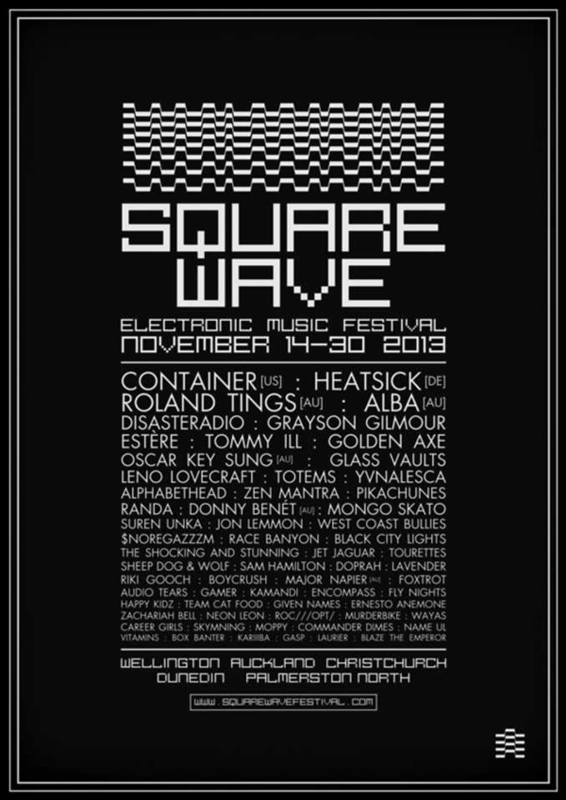 A more comprehensive version followed a couple of years later and it continues to be a valued resource for independent NZ bands heading overseas for the first time. By the end of the second day, the town was cleared out of alcohol and bottled water. To mark the switch from “camp” to “campus”, Blink asked everyone who bought a ticket to email him a picture of themselves so an ID card could be made for them (if they didn’t supply one, a picture of a celebrity was randomly assigned instead). 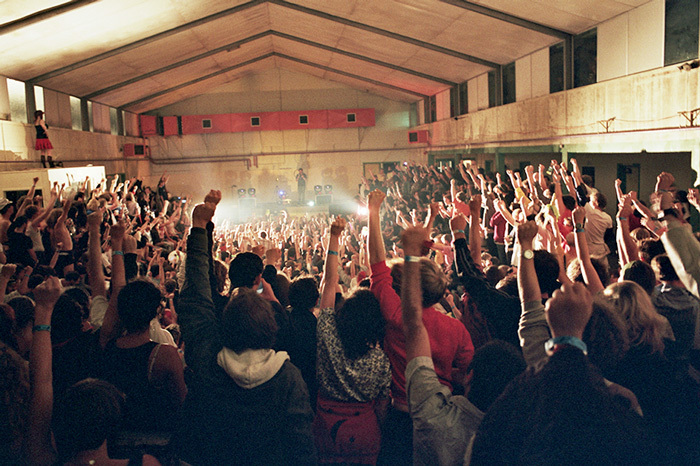 The location also fitted with the theme, since it was held at an old agricultural college, which had its own large barn and an empty Olympic-sized swimming pool – both of which were turned into venues for the event. The nearby town of Bulls didn’t know what hit it – by the end of the second day, the town was cleared out of alcohol and bottled water. The nice aspect of this spot was that it was only a 10-minute drive to the beach, so campers could take a break and have a swim. 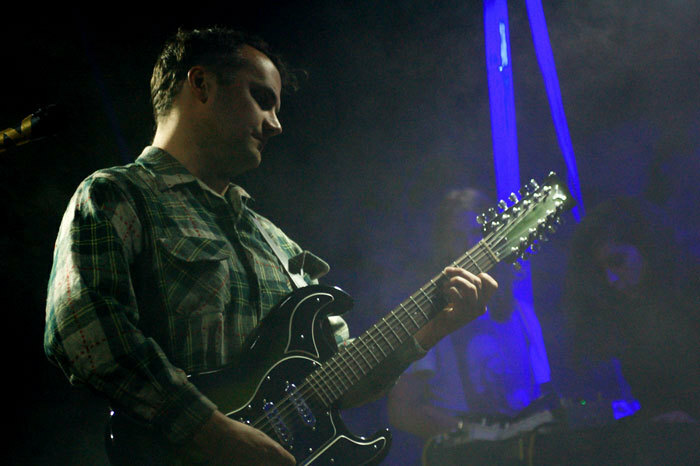 The first year at the Flock House (25-25 February, 2010) saw Blink bring in some of his most impressive overseas talent – with performances by Swedish indie legend Jens Lekman and US duo The Dodos. 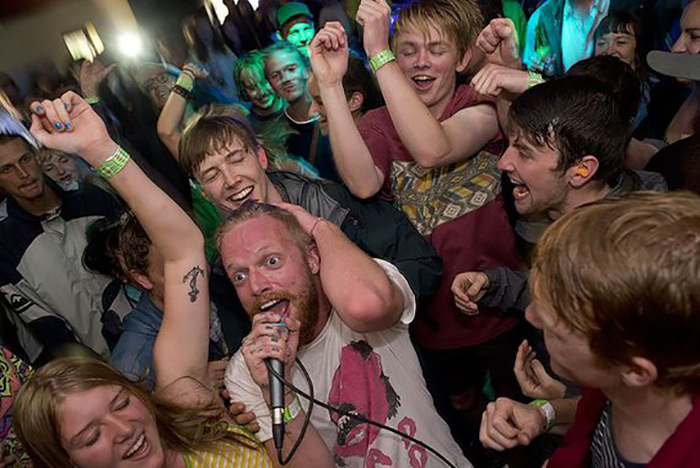 Though the image that stuck in many people’s minds was electronica act Dan Deacon leading a session of aerobics in the gym. Blink also arranged a mixtape swap for festival-goers and a roller disco (along with a suitable 80s-inspired playlist). 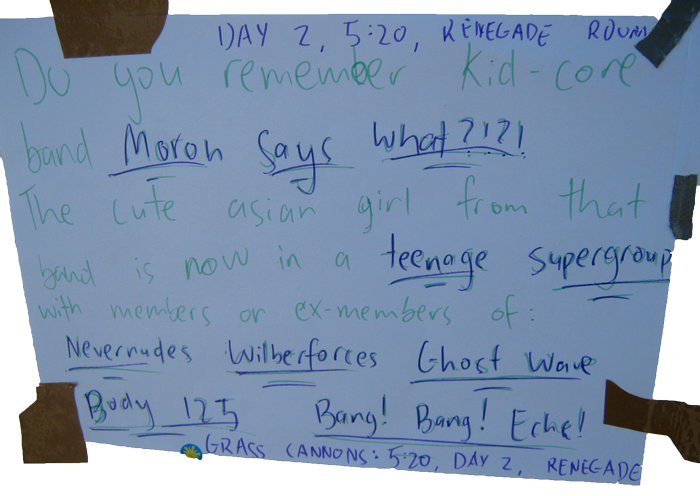 That year’s festival also put more emphasis on including visual artists in the line-up – creating exhibition spaces around the festival grounds and giving each artist a blurb in the camp booklet. Impressively, this included a number of established local practitioners such as Ronnie Van Hout and Ann Shelton. The previous year, he’d arranged a mobile stage so he could take advantage of different areas around the campus grounds. 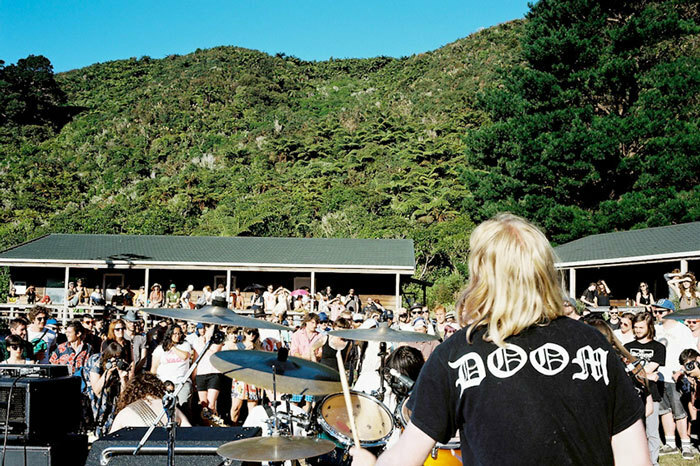 This year, Wellington band Teen Hygiene took this approach to its limit by setting up on the roof of the main building, playing two storeys above the crowd. 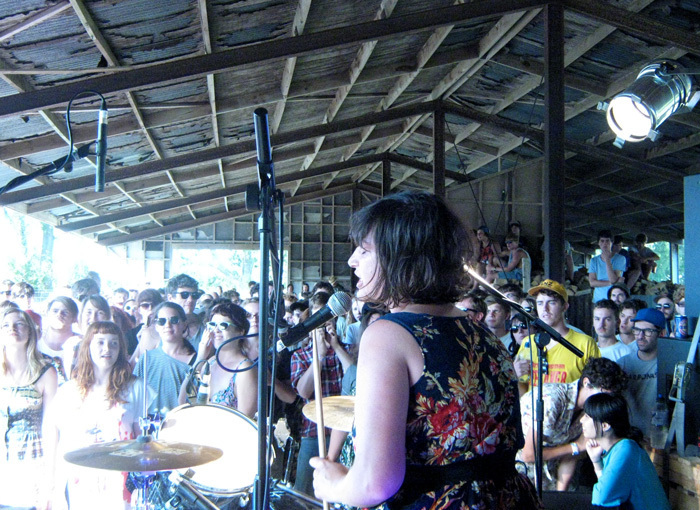 More upcoming US acts made the visit – Toro Y Moi and Caribou – though it was often the performances by local acts that stuck in people’s minds. Bachelorette surprised the crowd by playing with a backing band of programmed robots (The Trons), while the hyped up crowd in the swimming pool turned into a heaving mass of bodies, with pool toys bouncing over the top and constant stage invasions that saw the performers obscured by an army of dancing fans. By this stage, word had got around Sydney and Melbourne that meeting up with Blink was a young band’s best shot at covering their costs to play a show in New Zealand and he spent an increasing amount of time trying to pick the right acts. 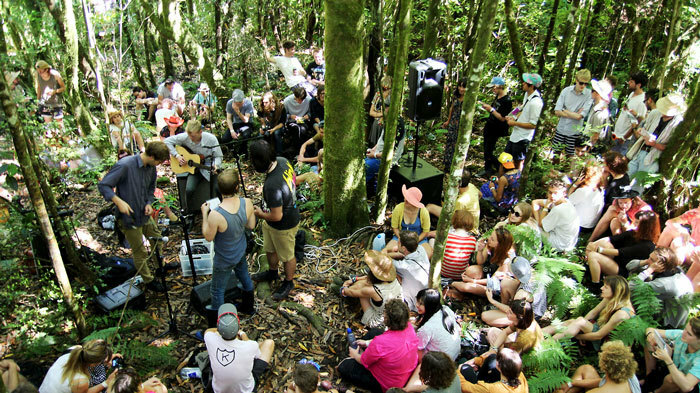 In 2012, Blink reduced the size of the festival (held 10-12 February) by a few hundred people to make it more manageable, brought back the “camp” name and returned to Homedale in Wainuiomata, where he’d previously had his most stressful festival in 2009. The beauty of the surrounding landscape was just too much to pass up and he took full advantage of it this time – arranging one stage in the middle of the forest and another at the edge of a lagoon. 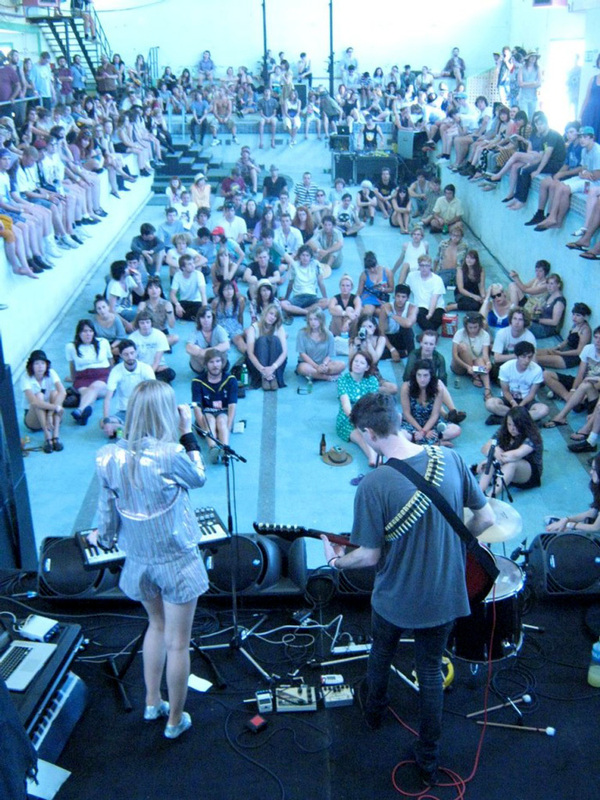 Some acts took full advantage of this, especially synth-pop duo Spring Break (Ryan McPhun from The Ruby Suns and James Dansey from The Sneaks), who performed at the water’s edge while audience members drifted past on inflatable toys and their set ended with them barreling straight into the water and swimming away. If running the festival each year wasn’t enough, Blink now planned to open a venue as well. 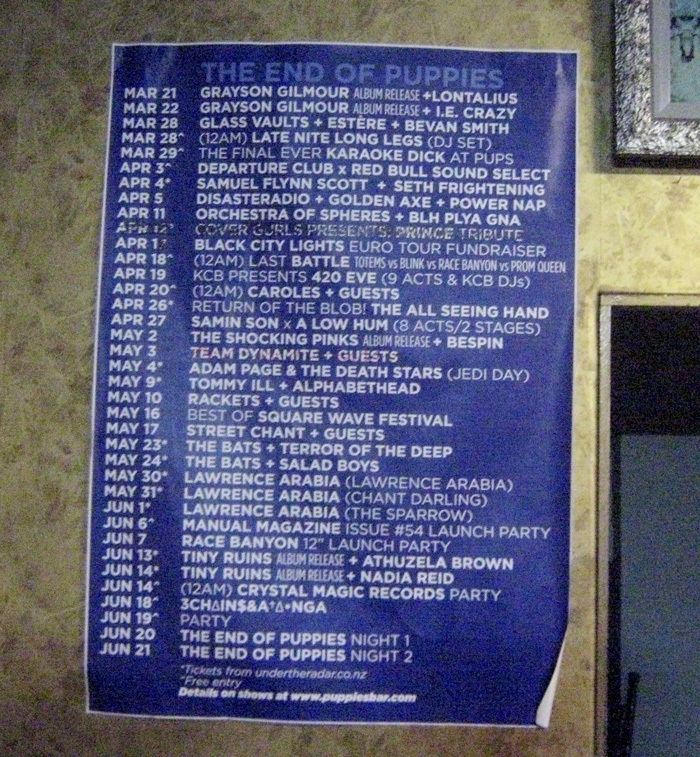 Puppies opened on 19 October 2012, though it only ran on weekends at first (and closed for January 2013, so Blink could plan Camp). Once again, he was driven by the desire to provide an example of how the local music scene could be improved. He originally tried to put these ideas into a book, The Problem With Music In New Zealand (originally written in 2009), but he decided not to release it after his friend, Ash Smith (Secret Knives) told him it was “far too bitchy”. 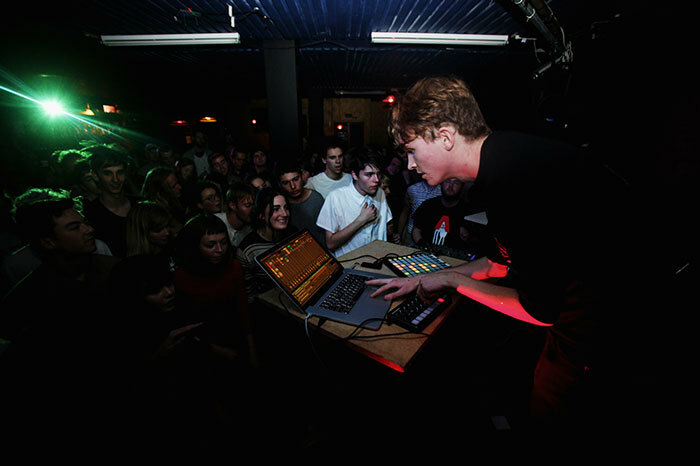 However his ideas led Blink to earlier carry out two short-lived experiments – a series of gigs at out-of-the-way bar, MVP in 2006, and a café/record store called Temporary in early 2011, the latter of which was brought to an end early when Blink left for another international tour with Disasteradio. 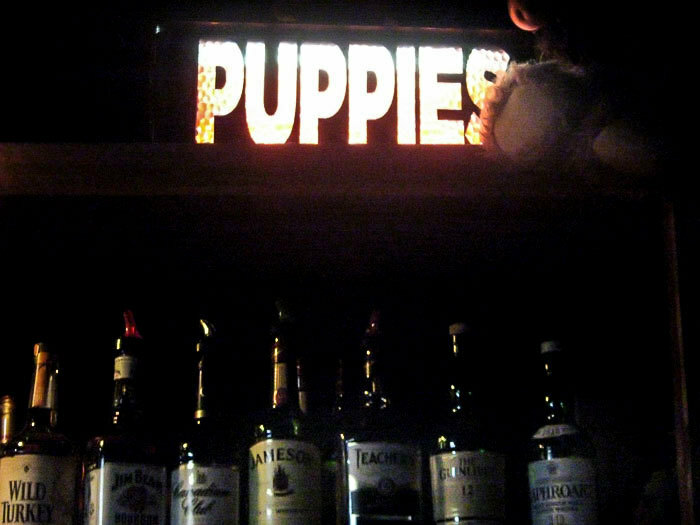 Blink’s new venue, Puppies, took over the space from the live music bar Happy. He also included a green room with an emergency kit of useful equipment (set list paper, spare batteries, guitar leads, etc), did his best to offer guarantees to bands from out of town, and rather than ever allow the charge to dip below $10, Blink tried inventive strategies such as having the door charge be redeemable at the bar. He made it easier for bands to sell their merchandise, initially by having a shop at the front of the venue where band merch could be sold whenever the venue was open. He later turned this into chill-out zone and then into an entire separate venue. Blink conceived Puppies as running just for a year to provide a test case for some of the approaches he wanted to test, though he had to sign a two year lease for the bar, so extended the scope of his plans. 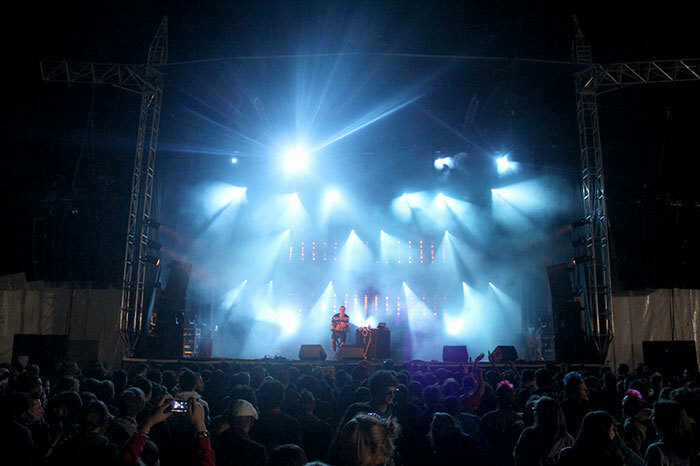 The 2013 event also put a particular focus on bringing new acts to the fore. He focused on a line-up that expressed the future of music within different genres. Rackets played the previous year, but Blink brought them back and put them on the main stage at prime time, wanting to emphasise their power as live trio. This was also the year he brought over a pair of highly respected indie acts from the US,Thee Oh Sees and Mt Eerie. Blink intended 2013 to be the last year of Camp, but he felt bad that he hadn’t told anyone and decided to do an “official” last event in 2014 (7-9 February). He arranged for legendary local act The Clean to make a rare appearance and had Liam Finn and Lawrence Arabia combine for an epic set of their greatest tracks. Blink soon had to close three of the stages and hurriedly re-jigged the line-up to accommodate the acts who’d lost their slots. Sadly the weather decided not to play along. On the morning of the first day, heavy drops began to fall and they became a relentless presence over the three days of the festival. Blink soon had to close three of the stages and hurriedly re-jigged the line-up to accommodate the acts who’d lost their slots. Campers pushed onward, acclimatising to being constantly wet, with the bravest ones sporting small new tattoos from the $10 tattoo parlour. 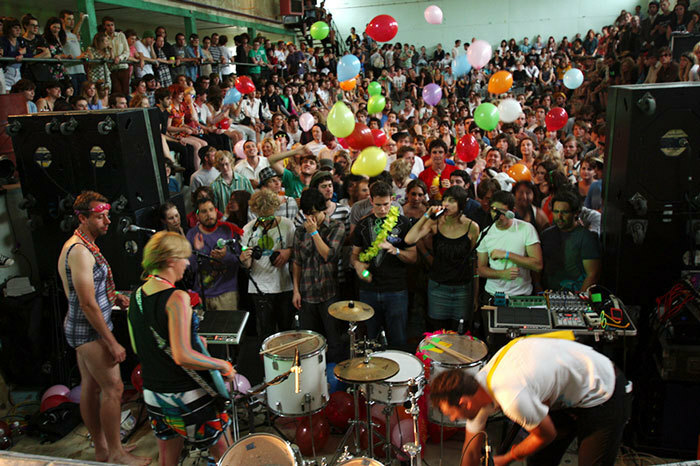 The one upside was that the one stage located indoors (the noisy room) now became host to some wild, packed shows as even the most popular acts were forced to move their sets inside. Puppies was also coming to an end and Blink started a Kickstarter fund to raise money for a final set of special events to run from March 21 to June 21, with contributors able to choose from a range of rewards from gig tickets to a special double-vinyl-LP compilation. He also chose to finally release a new version of his book on The Problem With Music In New Zealand And How To Fix It, which was published alongside an account of the experiments he had tried with his bar (Why I Started And Ran Puppies). 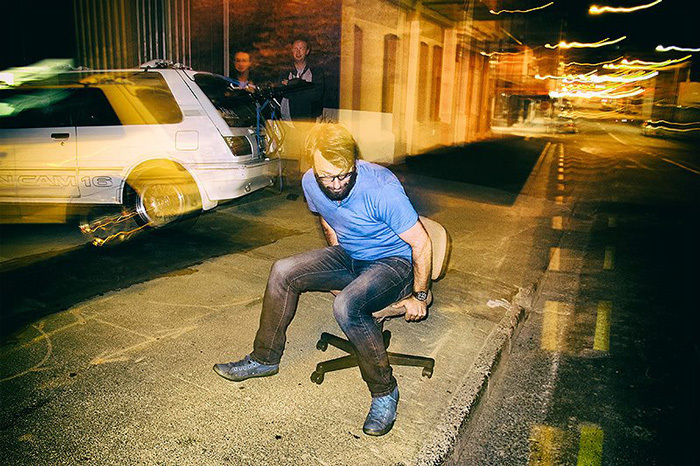 It covered all his new approaches to running a live venue discussed above, but also had wider strategies for creating a thriving DIY venue scene throughout New Zealand and took aim at the way APRA distributed royalties (which led to meetings between Blink and APRA management). Blink finally switched back to his birth name, Ian Jorgensen, asking interviewers to use it and printing this name on the cover of his book. He’d made a living from music for a decade, but it was only the profits of the bar that allowed him to pay off the last debts he owed to his parents for some of the leaner years of Camp A Low Hum. Yet, he disliked the association between the alcohol industry and local music, so didn’t feel comfortable continuing to be a bar owner into the future. You’d think it would’ve been a good time for Jorgensen to take some time off and relax, but that isn’t really his style. He already had a list of 10 other projects that he wanted to complete. Images courtesy of Ian Jorgensen, Petra-Jane Smith and Gareth Shute.